Over the past quarter, the stock market has been on fire. It moved up over 11% — more than the average for a whole year — in just three months. This type of rally does not happen often, and a big part of it has been the tax reform bill. Lower taxes are expected to increase profits, as well as encourage companies to increase investment and raise wages. However, one area of the market that has not shared in this overall rally has been the utilities sector. The chart below shows the returns for each main sector of the market. 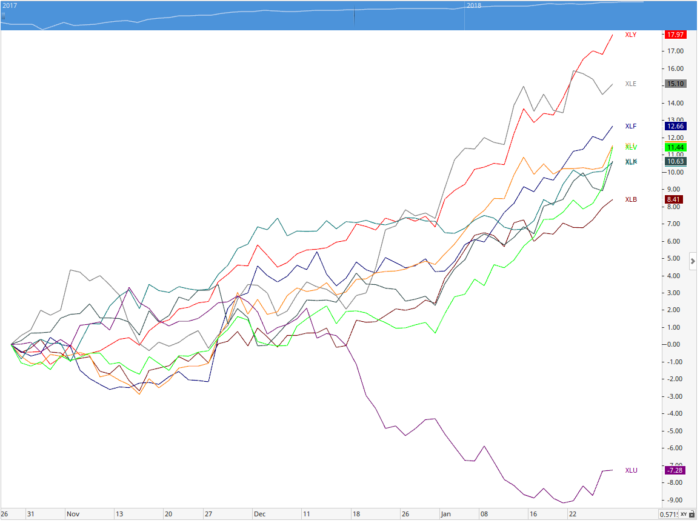 As you can see, they are all moving up together at a steady pace … except for utilities. There are two primary reasons that investors have historically bought utilities stocks: safety and dividends. First, safety has gone out the window somewhat in the midst of this rally. Investors are taking bigger stakes in riskier growth stocks, sending the market to new levels in the process. And why not? There’s clearly money to be made there for the time being, at least while there’s still demand. But the increased demand for these higher-growth stocks has taken from safer stocks like utilities. Second, rising interest rates are bad for utilities stocks. Utilities companies are typically loaded with debt, which is a fine way to fund a company as long as it can pay it off. So rising interest rates mean it has to pay more to fund that debt, which takes away from profits. But that’s not the only reason rising interest rates are bad for utilities. When rates are low, investors are more likely to buy high-dividend stocks like utilities because they’d get a higher yield than from bonds. But when interest rates go up, people are more likely to buy bonds, which are safer than stocks, to receive yield. A good way to play the weakness in the utilities sector is by buying the ProShares UltraShort Utilities ETF (NYSE: SDP). 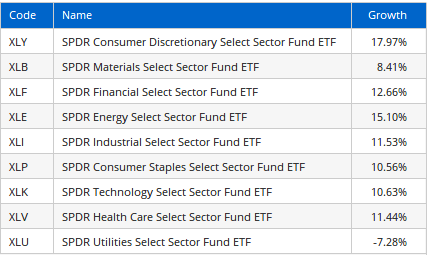 This exchange-traded fund (ETF) shorts utilities stocks for you. And if utilities stocks continue to fall, the ETF will keep going up, as it’s done for about a month now.